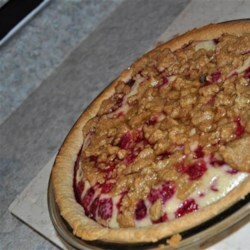 "Creamy raspberry pie with a sweet crumble topping." This is a great recipe, 5 star, the only thing I will add next time is a maybe a tablespoon of cornstarch to the berries to help retain the juice. This pie is one of my favorites. The only thing I do, as some others have said, is add cornstarch to the berries, it can be a bit runny otherwise. Great recipe!